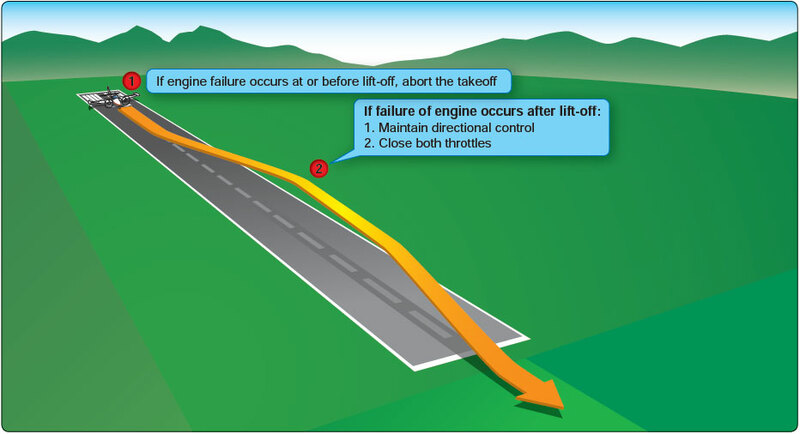 A takeoff or go-around is the most critical time to suffer an engine failure. The airplane will be slow, close to the ground, and may even have landing gear and flaps extended. Altitude and time is minimal. Until feathered, the propeller of the failed engine is windmilling, producing a great deal of drag and yawing tendency. Airplane climb performance is marginal or even non-existent, and obstructions may lie ahead. An emergency contingency plan and safety brief should be clearly understood well before the takeoff roll commences. An engine failure before a predetermined airspeed or point results in an aborted takeoff. An engine failure after a certain airspeed and point, with the gear up, and climb performance assured result in a continued takeoff. With loss of an engine, it is paramount to maintain airplane control and comply with the manufacturer’s recommended emergency procedures. Complete failure of one engine shortly after takeoff can be broadly categorized into one of three following scenarios. If the engine failure occurs prior to selecting the landing gear to the UP position [Figure 12-11]: Keep the nose as straight as possible, close both throttles, allow the nose to maintain airspeed and descend to the runway. Concentrate on a normal landing and do not force the aircraft on the ground. Land on the remaining runway or overrun. Depending upon how quickly the pilot reacts to the sudden yaw, the airplane may run off the side of the runway by the time action is taken. There are really no other practical options. As discussed earlier, the chances of maintaining directional control while retracting the flaps (if extended), landing gear, feathering the propeller, and accelerating are minimal. On some airplanes with a single-engine-driven hydraulic pump, failure of that engine means the only way to raise the landing gear is to allow the engine to windmill or to use a hand pump. This is not a viable alternative during takeoff. When operating near or above the single-engine ceiling and an engine failure is experienced shortly after lift-off, a landing must be accomplished on whatever essentially lies ahead. [Figure 12-12] There is also the option of continuing ahead, in a descent at VYSE with the remaining engine producing power, as long as the pilot is not tempted to remain airborne beyond the airplane’s performance capability. Remaining airborne and bleeding off airspeed in a futile attempt to maintain altitude is almost invariably fatal. Landing under control is paramount. The greatest hazard in a single-engine takeoff is attempting to fly when it is not within the performance capability of the airplane to do so. An accident is inevitable. Analysis of engine failures on takeoff reveals a very high success rate of off-airport engine inoperative landings when the airplane is landed under control. Analysis also reveals a very high fatality rate in stall spin accidents when the pilot attempts flight beyond the performance capability of the airplane. If the single-engine rate of climb is adequate, the procedures for continued flight should be followed. [Figure 12-13] There are four areas of concern: control, configuration, climb, and checklist. The first consideration following engine failure during takeoff is to maintain control of the airplane. Maintaining directional control with prompt and often aggressive rudder application and STOPPING THE YAW is critical to the safety of flight. Ensure that airspeed stays above VMC. If the yaw cannot be controlled with full rudder applied, reducing thrust on the operative engine is the only alternative. Attempting to correct the roll with aileron without first applying rudder increases drag and adverse yaw and further degrades directional control. After rudder is applied to stop the yaw, a slight amount of aileron should be used to bank the airplane toward the operative engine. This is the most efficient way to control the aircraft, minimize drag, and gain the most performance. Control forces, particularly on the rudder, may be high. The pitch attitude for VYSE has to be lowered from that of VY. At least 5° of bank should be used initially to stop the yaw and maintain directional control. This initial bank input is held only momentarily, just long enough to establish or ensure directional control. Climb performance suffers when bank angles exceed approximately 2 or 3°, but obtaining and maintaining VYSE and directional control are paramount. Trim should be adjusted to lower the control forces. Figure 12-14. Typical “engine failure after takeoff” emergency checklist. As soon as directional control is established and the airplane configured for climb, the bank angle should be reduced to that producing best climb performance. Without specific guidance for zero sideslip, a bank of 2° and one-third to one-half ball deflection on the slip/skid indicator is suggested. VYSE is maintained with pitch control. As turning flight reduces climb performance, climb should be made straight ahead or with shallow turns to avoid obstacles to an altitude of at least 400 feet AGL before attempting a return to the airport. Having accomplished the memory items from the Engine Failure After Takeoff checklist, the printed copy should be reviewed as time permits. The Securing Failed Engine checklist should then be accomplished. [Figure 12-15] Unless the pilot suspects an engine fire, the remaining items should be accomplished deliberately and without undue haste. Airplane control should never be sacrificed to execute the remaining checklists. The priority items have already been accomplished from memory. Figure 12-15. 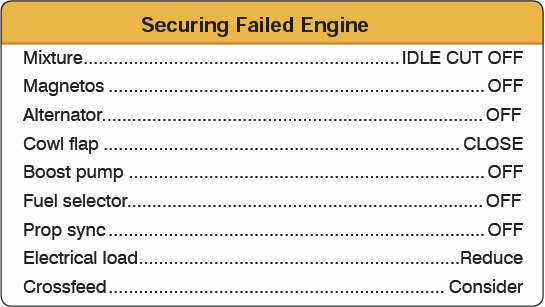 Typical “securing failed engine” emergency checklist. Other than closing the cowl flap of the failed engine, none of these items, if left undone, adversely affects airplane climb performance. There is a distinct possibility of actuating an incorrect switch or control if the procedure is rushed. The pilot should concentrate on flying the airplane and extracting maximum performance. If an ATC facility is available, an emergency should be declared. 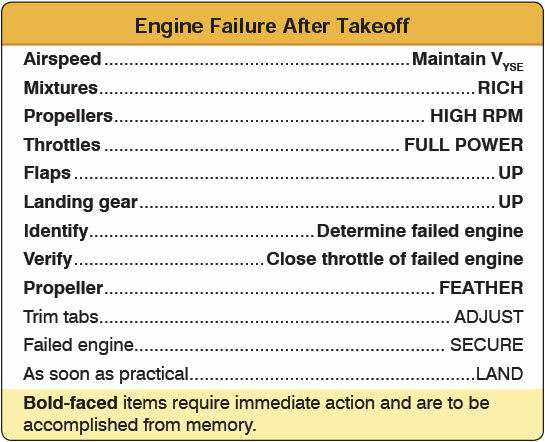 The memory items in the Engine Failure After Takeoff checklist may be redundant with the airplane’s existing configuration. For example, in the third takeoff scenario, the gear and flaps were assumed to already be retracted, yet the memory items included gear and flaps. This is not an oversight. The purpose of the memory items is to either initiate the appropriate action or to confirm that a condition exists. Action on each item may not be required in all cases. The memory items also apply to more than one circumstance. In an engine failure from a go-around, for example, the landing gear and flaps would likely be extended when the failure occurred.